I've neglected to mention that upon arrival at Vintage Towers, we found, among the other niceties of the room (fresh water, cookies, nice robes), a Christmas Tree ornament featuring the inn itself (seen in the thumbnail to this post). As we'd later learn, this was a gift for us to celebrate our honeymoon. That's a nice little touch. We have breakfast at the inn, this time prepared by the owner, a slightly (read: far) less gregarious persona than his inn-sitter. He makes us a very nice quiche, though, as well as some bacon, and mini pumpkin muffins. With the car all packed up, we eat breakfast and head out, knowing that the drive will be at least 2 hours, and worried about traffic. Fortunately, while our route takes us through Oakland, we're never on actual city streets (unlike if we'd driven through San Francisco). We get into San Jose with about an hour to spare, make a quick U-turn at the arena lot to avoid the $25 parking, and find a garage in Little Italy that's charging just ten bucks. Added bonus: we get to walk through San Jose's Little Italy, which might in fact be the Littlest Italy ever. It's two roads. There's a (supposedly world-famous) BBQ joint, which, naturally, you’d expect to find in Little Italy, and a bunch of small houses. It's got a big sign, though, so there's that. San Jose seems like a small city, though it claims it is the "capital of Silicon Valley", as though Silicon Valley is its own state. Someday, probably, but not yet. The rink is nice, though the concourse feels underdeveloped. There's no pro shop, just stands around the concourse. Everything is accessible from the same level, which is nice, and makes a big arena feel small, and, well, accessible. We get lunch from an Italian place, not bad, for arena food. I grab a beer because I can get Molson in San Jose, California. It's Molson Golden, not Canadian, but whatever, it's Molson, and it's pretty good. We get to our seats - 18th row, in the corner, pretty nice seats - just in time for warm ups. 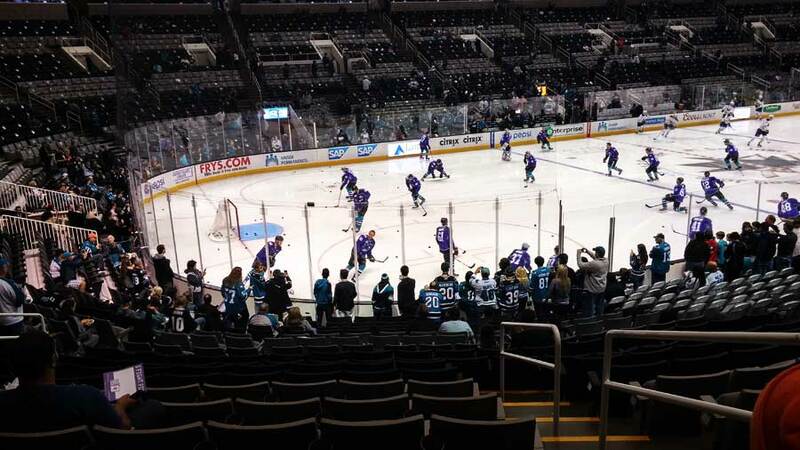 The Sharks come out in purple jerseys. Purple? Okay, I know they came into the league in the 90s, and are stuck with that questionable teal-orange-black color scheme that was cool for about two years (I even owned a couple of Sharks hats, back in the day), but… Purple? Oh yes, purple. It's part of today's promotion, "Hockey Fights Cancer". The purple jerseys will be auctioned off at a later game. Fortunately, they'll only be wearing them for warm-ups. If I wanted to see a hockey team wearing the hideous combination of purple and teal (because they’re wearing their teal socks – I wish we were closer to the ice to get a better picture of how horrendous this looks), I'd travel back in time to the early 90's, and watch the Anaheim Mighty Ducks. On second thought, this is probably close enough. The intro is pretty rad. The lights go down, a video plays on the jumbotron, and the Sharks' mascot, SJ Sharky (who Sarah insists should be named Bitey) rappels down to the ice. After this, a giant, open-mawed shark head descends from the rafters to the ice. Smoke billows forth, the jaw glows red, and the players stream out of it to a metal song. Not going to lie, it's one of the reasons we wanted to come to this game. We made sure our seats would be right across from it. So worth it. A great gaping maw, belching fire… And hockey players. The game itself is lackluster. The Sabres are terrible, but the Sharks are lifeless, and can't capitalize. No goals through two periods. In the 3rd, on a really nice play, the Sabres take the lead, then extend it to 2-0 a few minutes later on a bad mistake by Stalock, the Sharks goalie. This seems to wake the Sharks up, and they fly around the Sabres' zone and score while Buffalo's second goal is being announced. The action is intense after this, but the Sharks can't get the equalizer, even with Stalock pulled in the final minute, and they fall to the lowly Sabres. Apparently the Sabres have won the last 8 games in San Jose. Fortunately for the Sharks fans, there's little chance of the two meeting in the Stanley Cup Finals. Back on the road, we set off on the quick route to Monterey Bay, when I remind Sarah we'd talked about driving along the bay, even though it would take a little longer. She makes a quick adjustment to the GPS, and we head northwest, over the Santa Cruz mountain range (a similarly winding road to other mountain passes, but far less scary, as it is a full-on highway), then eventually to 1 south. This is still an inland route for most of the way, until we get to the actual bay, just north of the town of Monterey, when we see the bay for the first time. It is beautiful, but we don't have much time to ooh and ahh before we have to navigate the small towns around it. The directions are simple, but the streets aren't terrifically marked, and as we turn up Eardry to find Pine, we find instead the sun, setting over the hill and shining directly in our eyes. No longer having retinas makes finding the street a little difficult, but with the GPS and Sarah navigating, we manage to take the right turn. After a short drive, we're scraping the bottom of the front bumper on the dip at the beginning of the inn's driveway, and squeezing into a spot in the tiny parking lot. Now, where the Vintage Towers Bed & Breakfast was homey and super-personal (at times, too personal? ), the Pacific Grove Inn is a little more removed and professional. It's still a quaint little bed & breakfast, but it just doesn't feel as personal. No real introduction at check-in and a bit more of a business-like attitude. We don't have to make a commitment to breakfast, though, which is nice, as is the slightly larger window to eat breakfast, as it’s more of a restaurant with individual tables than a gathering of all the guests. Our room is in the back building, and in the back of it. I'm not complaining, as I like that it is a little secluded. The bed is odd; some sort of temper-pedic, a thick slab of memory foam. It makes odd noises when we lie on it, but it doesn't transfer movement across it, which is kinda cool. The room is spacious, but oddly laid out, making it difficult to leave our suitcases in one spot. Our bathroom is attached to our room, though, which is nice. We get settled, and it is dinner time. We consult Fodor's as well as the Inn's recommendations, and decide on a French restaurant around the corner called Fandango. It looks close on the map, but we check the navigation just to be sure, and it is only a couple of minutes away. We call ahead for a 7:00 reservation, and change into slightly nicer clothes. The walk is nice, especially after being in the car for so long, and we get a table in the upstairs room by a window overlooking the bay. It's night, so we can't see anything, but in the daylight, the view is probably quite nice. We start with Giant Calamari, which turns out to be lightly breaded calamari steak. It is quite nice, almost a Calamari Picatta. The meat is firm, but not dry. Pretty unique. Sarah gets a scallops dish, with tagliatelli and basically the same sauce. The scallops are well-seared and tender, and the sauce goes well with them. I get the Paella Fandango, a dish for which they are well-known. It is a large skillet of rice with clams, mussels, scallops, calamari chunks, shrimp, and chicken (for some reason). It is good, but enough for the two of us, and I can't finish it. I'm not full, just done. We get creme brulee for dessert. The crust is perfectly toasted - caramelized, but not burnt, and the custard is creamy and rich. A nice end to the meal. We walk back up to the inn in time to catch the end of Game 4 of the World Series. We get ready for bed and watch the Giants complete a comeback victory, which makes the guest in the room next to us very happy. Apparently, she is a Giants fan. Shortly after she calms down, we crash. Next: How Long is 17 Miles, Anyway?